Have you tried allocating more memory in either the global minecraft settings in the Curse client or in the profile options? Try giving it 5+ gb and if you still get the error after giving the pack more memory then you're using a 32 bit version of Java and should download a 64 bit JRE. 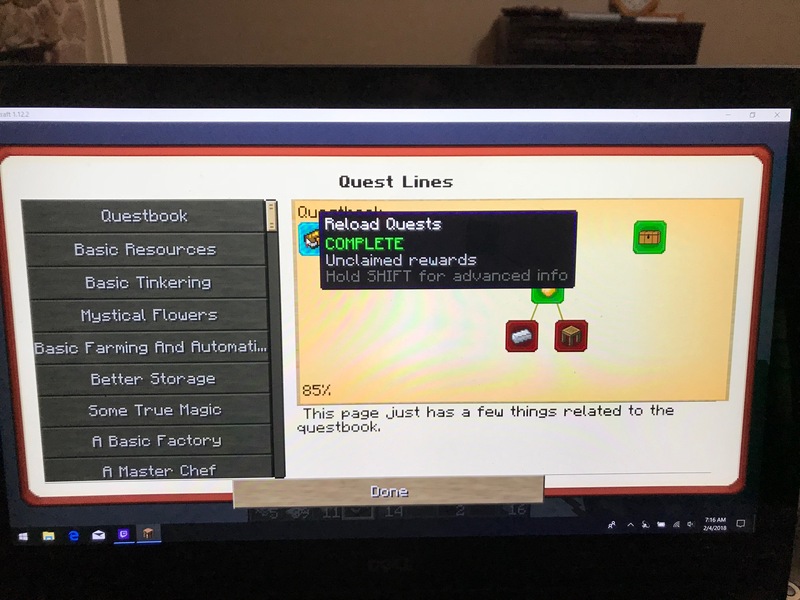 I sympathize with you... it would be nice if the entire quest tree under "Questbook" was visible so you could at least hold shift on locked quests and see what they were requiring. you need to allocate more memory to the game. when you look at your mods in Twitch, click inside the description rather than play, This will bring you to an information page. under memory settings, de-select USE SYSTEM OPTIONS and slide the memory bar to the right. NOTE: you need to leave your system some memory to operate, so don't slide it all the way to the right. You need more RAM for this pack. At least 5-6GB for this pack alone. 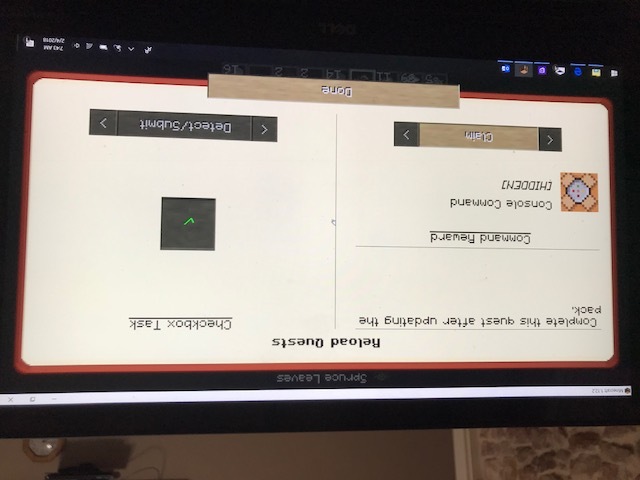 I am having difficulty getting the reward for completing Quests. I have tried to claim several, but nothing happens. Have a look at the screen shoots. Is grinding stone the only way to get emeralds? I'm doing the hardest difficulty (Forgot what it was called sorry), and I need to get 6 silky gems to move on. The problem is that it is so painful to get emeralds; I've smashed a stack of compressed stone without getting a single one. Is there any other way to do this? Is anyone else finding getting sugar cane a pain? It requires a life infusion of 9.5 hearts, meaning you need to have eaten 100 unique foods to get it. Getting sugar from witches isn't productive enough and it's starting to be a real hold up, and I can't see any other way of getting it. Sugar cane is not the best way to get sugar. You should be investigating rice for your sugar needs. Another way to get sugarcane is Botani. Fairly easy as well. This is especially true since as far as I can see, to get sugar from rice, you need to use the crusher, which for me is not currently available. Separately, I don't mind food being nerfed but it's fairly hard to vary you diet with Pam's locked down. If I upgrade to the new version of Modern Skyblock, will it make me start over or ruin my save? It worked fine for me. Had to reset a few preferences but that's about it. Noticeably fewer evolved Enderman though a few still appear even with everything lit up. Also, I think the "difficult" start (magma island) is way too easy, as you will never need the first stage of combustion or a cobblestone gen (even easier with the early hopper). Dont really know how to counter that, just a thought. All of the islands make some part of progression harder, and some part easier. There is no "hardest" island. This is exactly what Bartz24 was aiming for. I have 8gb of ram allocated to this pack. The game crashes upon initialising phase 3, as far as i can tell its due to tinkers construct. I have removed different mods and disable in the configs to reduce pack size (as suggested in a earlier post), no luck. Still crashes. To fix this issue i then downloaded the newest version of Optifine, the game loads in. But all textures are missing, to fix this issue, i then downloaded a basic texture pack, when loading the texture pack. All textures are missing again. So tried on the newest version that fixed the slow loading in times. Same issue. Hey great fan of this mod and the predecessor. But whenever I try to update the profile it comes up with a message saying "Cannot update: Profile in use in another application, please close any files which may be open in another program" (see screenshot). But Twitch is the only thing open on my computer. I just turned my PC on so nothing is running in the background that I'm aware of. Anyone know how to fix it? This seems to be a problem in the Twitch Client. If a PC-restart doesn't help, try to reinstall the modpack or the Twitch Client if this problem is also happening on other packs. It may just because of your bad luck, it should be a average of grinding 171 compressed stone to get 6 emeralds. Any chance of adding either Refined Storage or Equivalent Energistics when it's updated? Or both?